Writer and code artist Judd Morrissey is an Assistant Professor at the School of the Art Institute of Chicago in Writing, Art and Technology Studies, and Performance, where he creates electronic literature, performance art, and site-specific installations. Morrissey's work -- which includes My Name Is Captain, Captain (in collaboration with Lori Talley, Eastgate Systems, 2002) has been exhibited and published Internationally including Visionary Landscapes: the 2008 Electronic Literature Organization Conference, Vancouver, WA; The Iowa Review Web; Eastgate; E-Poetry 2005, London; Cerisy 2004, Normandy, France; Computers and Writing 2004; Language and Encoding, University of Buffalo; p0es1s: International Exhibition of Digital Poetry, Germany; the Museum of Contemporary Art, Chicago; Rockford Art Museum; Chicago Cultural Center; Mobius, Boston, MA; and the DeCordova Museum. In 2006, Morrissey was a recipient of a Creative Capital/Andy Warhol Foundation Arts Writers' Grant. He is a founding member of the interdisciplinary art-making and curatorial collective, OPENPORT and an Associate Member of Goat Island performance group. 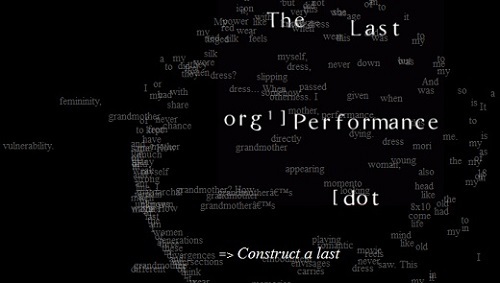 For Authoring Software, Judd Morrissey writes about the creation of The Last Performance [dot org], a poetic "evolving collaborative space" in which an array of generative text -- collaboratively composed in thousands of "lenses" -- assembles and reassembles in an elegant dome architecture structure. The Last Performance is a constraint-based collaborative writing, archiving and text-visualization project responding to the theme of lastness in relation to architectural forms, acts of building, a final performance, and the interruption (that becomes the promise) of community. This project was conceived in response to the work of the Chicago-based performance collective, Goat Island, (of which I am a part) and their decision, after 20 years of practice, to create a last performance. The electronic work is evolving over two years in parallel with the creation and performance of the company's final performance work, The Lastmaker. The structure of the project is taken from my research with Goat Island into double buildings, a phrase we are using to describe spaces that have housed and survived multiple historical identities, with a specific concern for the functions of churches, mosques, and museums. The central structure of The Last Performance is a virtual dome, based on the cupola of a particular Croatian double building, a construction of circles within circles consisting of 4,680 glass lenses. The lenses of the cupola have been transposed as compositional spaces that will be populated until the dome is complete. The dome writings are also processed as source material to create a constantly evolving textual landscape. I wanted to situate The Last Performance [dot org] in relation to the overall dialogue and data-flow of the web as an evolving collaborative space -- to engage "web 2.0" as a site for composition, a readymade environment, a foundation for responsive practices. It was important to me that the project be more or less transparent with current open-source web standards and protocols. For the basic functionality of this project, I used the PHP/MySQL content management system, Drupal. This enabled me to rather quickly lay a foundation for handling participant accounts, session tracking, built-in RSS aggregation, content tagging, and many other useful and/or ubiquitous features. The overall visual architecture and textual processing is handled using PHP for database queries, parsing and re-composing, and mathematically determining the (CSS) positioning of elements based mainly on the geometry of circles. Some text imaging is also done with the GD Graphics Library for PHP. Many of the individual pages are HTML files using Ajax to communicate with PHP. For some time, I have been working mainly with an integrated set of web-based languages, so this project continues to extend this approach. For writers or artists interested in experimenting with PHP, I recommend the MAMP / LAMP / WAMP applications for a very quick and easy development environment.